Remington R1 Enhanced 45 for sale with cheap shipping and helpful service. Remington Part# 96360. 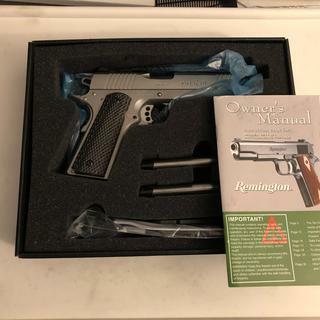 Buy the Remington 1911.45ACP ENHANCED COMMANDER R1-S 4.25-inch 8rd online with flat-rate shipping and the lowest price from GrabAGun, the cheapest online gun store. I like the ease of maintaining stainless steel and this gun got very good reviews online. The "enhanced" model has a lot of features for a good price. I think it's beautiful. Will not be firing it, just purchased to add to my collection. ;look at it wow I saw this gun in my local gun shop but it was the full sized wanted this one and the price was awesome . Beautiful gun and I have always wanted one. I wanted to add a 45 to my carry , and the grab a gun price was too good to pass up. Very nice gun especially for the great price. Quality is very good. The only thing I would change are the grips. They are to aggressive for me and not that comfortable. I’ve inly put 100 rounds through it so far but so far so good. Not one failure in the first 100 rounds. I have only fired ball Ammo so far so the next test will be hollow points. If you are looking for a budget 45 in stainless this would be a great choice. The quality far exceeds the price! I have only 250 rounds on this gun but no problems have popped up . I have put every type of ammo i can think of in it and it has ran it all perfect. I will be buying another one as the trigger is one of the best i have ever used. Grab a gun was awesome in how fast they got my gun to me as well and the price was right.. Awesome 1911 at a great price! Purchased my 4.25 R1 Enhanced less than 2 weeks ago and already ran over over 700 rounds in two sessions with it. Not one hiccup!! I researched some of the much higher priced 1911's prior to this purchase and saw many of the popular ones...kimber, S&W, D. Wesson's etc... had break in phases where there were problems with ejections/feedings initially....I'm still at the very infant early stages... but impressed with my first two sessions. Great feel and handling. Fantastic price for superb quality. Very glad I purchased this pistol. Fun to shoot! Better to use ball 230 grain ammo for optimal performance. I like the gun. Do I have better ones? Sure. But for what it costs its a good deal. Did not like my lead reloads too much though - could be because of the shape (truncated cone). Great gun!!! Caught it at a really good price. Fast service! Purchased two of these Guns from Grab a gun, price was good and the guns are even better. Very nice guns.